Sometimes making positive lifestyle or habit changes can bring out the worst in us. It starts out with joy and excitement about something new, and then as we settle in, our busy minds take over and try to sabotage our efforts. Sometimes external things like well-meaning grandparents going overboard with gifts, money emergencies, or other life situations get in the way, but usually the sabotage starts with us. 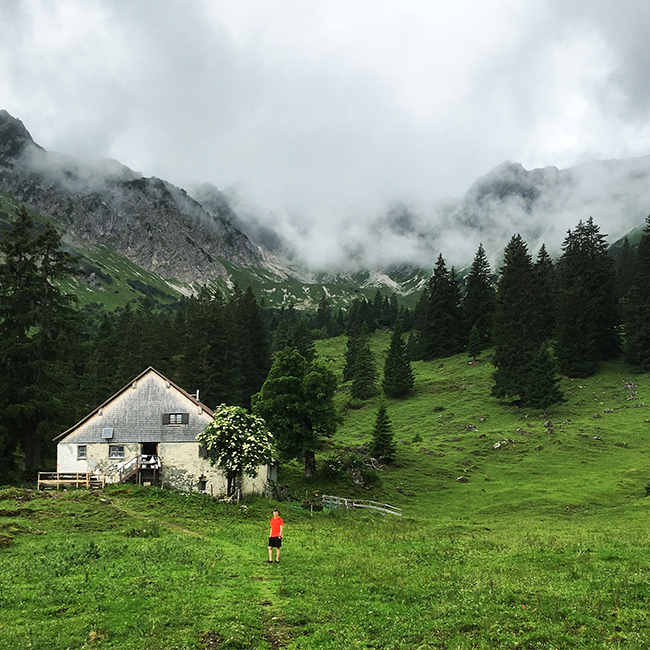 While these aren’t the 7 deadly sins, they are deadly sins that could slow down or halt your efforts to move towards a simpler, happier, more fulfilling life. Avoid these 7 deadly sins while simplifying your life or making any positive lifestyle or habit change. When you compare your efforts to others, especially others who are years into the process, you discount the progress you’ve made and the benefits you are experiencing. Stay present and keep your eyes on your own stuff. Use other people’s experiences as inspiration, but create your own adventure when it comes to simplifying your life, because after all … it’s your life. If you are looking for a fun experiment to help you engage in simplicity, try one of these. 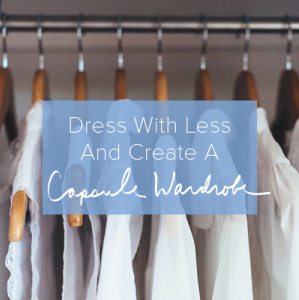 It might take 3 years to pay off your debt, or 10 months to simplify your wardrobe. You didn’t complicate your life overnight, and you probably won’t simplify it overnight. When you feel impatient and frustrated that things aren’t happening faster, focus on the benefits you are experiencing right now. For instance, if you are paying down debt, but not even close to finishing, perhaps you are sleeping better because you know you aren’t going deeper into debt. Or, if you’ve started decluttering, think about how you feel in the most decluttered space in your home. Use that feeling as momentum to declutter the next space. Letting go of stuff and obligations can stir up guilt. You might feel guilty for letting things build up, for not paying attention to what really matters, or for overspending. It’s time to let the guilt go with the stuff. You’ve paid enough. You paid with your money, your time and attention, and with your heart and these guilty feelings. You can let go now. If you struggle with letting go of guilt, try this three step process. There is no one right way to do this simplicity thing, but if your focus is on doing it perfectly, chances are you won’t do it at all. Give yourself permission to figure things out along the way. I can think of many times I didn’t try something because I was afraid I couldn’t do it, or because I was afraid I wouldn’t do it the right, or best way. Usually though, I was just afraid it would be ugly. When I say ugly, I mean challenging to figure out, or uncomfortable and imperfect. Perfection doesn’t encourage you, it derails you. There is no room for it in your simple life. If you are excited about simplifying your life, it’s natural to want everyone around you to be excited too. 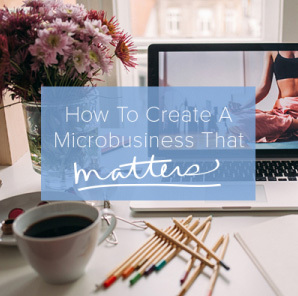 Instead of focusing on simplifying your own life, it’s easier to focus on getting everyone on board. Instead of nagging and begging and pushing your agenda on others, be an inspiration by walking the walk. As Rob Bell says in this podcast, “You cannot bring people where they don’t want to go.” If you want people to see the joy in less, live joyfully with less. Instead, fill your newfound time and space with things that really matter to you. If you don’t know what that is yet, fill your time and space with curiosity, self-reflection, and love. Living in fear of what others may think of you, struggling with the fear of not having enough or being fearful of needing something just in case thwart your efforts to let go and live more simply. When we live in fear and scarcity, we forget to live. 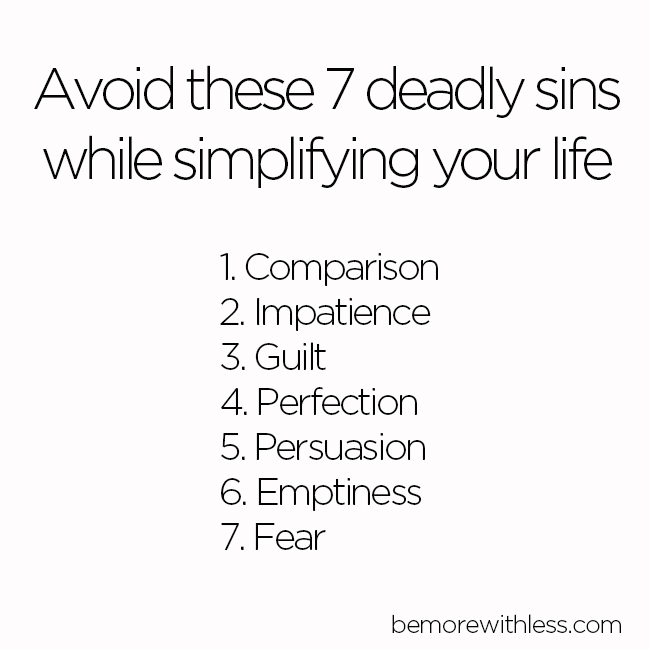 If any of these 7 deadly sins have gotten in your way, or tripped you up as you attempt to simplify your life, that’s ok. I’ve struggled with each of them at one time or another, and I’m sure I will again. I’ll do my best to avoid them, but even more importantly, I will notice them instead of getting carried away by them. Courtney, that was an excellent piece…thank you very much for all you do for us! I’m trying really hard to ban all those out – especially fear. It’s definitely a struggle but I’m sure hoping I’ll manage one day… And be able to pass that on to others! Comparison and Impatience. That is me! This is so inspiring! I can relate to all of these. It’s helpful to know I’m not alone and it’s not always easy to make a lifestyle change. Thanks for the reminder to relax and enjoy the journey! I absolutely love this post! It is the best feeling when you realize you’re not the only one dealing with these problems when trying to simplify your life. Thanks for the relief! Choose action over fear. This is what I need right now. Apart from that, I always compare myself with others. I think this is not going to help at all because it only makes me feel inferior when I see others have accomplished better results than me. 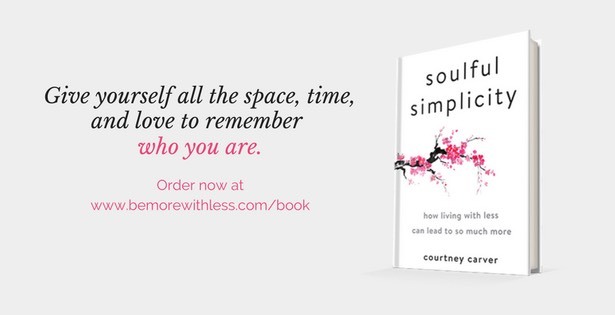 These are truly sticking points to simplifying your life. For me Comparison is truly a deadly sin. I love that you suggest using someones success as inspiration instead of a measuring stick. I have also learned to realize that some success is just a short highlight representation without some of the downsides. Perfectionism, yep. And fear. Thanks for this; you make things seem doable in a calm way, unlike some autocratic advice-givers! I can definitely relate to this. Sometimes it seems like other people have it all sorted out. It’s encouraging to see others who have similar struggles to me. Thank you! For me, impatience + comparison are the hardest to overcome. I’m naturally an extremely impatient person. I’m so goal-oriented so once I set my mind up to something, I want it to be manifested immediately. I don’t know what it is. Patience is TRULY a virtue. And when it comes to comparison, it’s hard not to put yourself side-by-side to others who have achieved your goal. But I find it helpful to 1.) focus on getting there yourself because focusing on them is wasting your time + energy and 2.) reminding yourself that they didn’t get there overnight. It wasn’t easy for them no matter how easy it may seem. And even if it was simpler/easier/faster for them, you’re a different person with different experiences than them so your journey will be different. I struggled with fear a few years ago. It has been a very costly experience. If I can encourage one person it will be worth it. 1 John 4:18 says perfect love casts out fear. Fear is in our mind. FALSE EVIDENCE THAT APPEARS REAL. Faith is our most powerful weapon over fear. What about feeling overwhelmed? Very counterproductive. I would have included that in this list here. Feeling overwhelmed, not knowing how to start a change, procrastination ensues, vicious cycle. Recommend anything? I know, I know, break it down into smaller more manageable tasks. Anything else though? This was such a wonderful post to stumble upon today. I was just telling someone how I felt paralyzed by perfection – unable to make a decision on something trivial because it “might not be the best one” or because I might regret it later. I feel motivated to make a decision and move on.